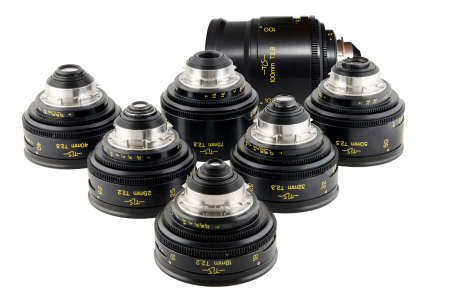 Since the 18mm Cooke Speed Panchro re-housing prototype was announced at IBC in 2012, TLS has designed and manufactured a complete range of CSP re-housings. We can update the entire range, which includes: 18mm s1/s2/s3, 25mm s1/s2/s3, 28mm s1, 32mm s1/s2, 35mm s1, 40mm s1/s2, 50mm s1/s2, 75mm s1/s2, and 100mm DFP s1/s2. 100mm Kinetal – 150mm Kinetal, both of which will cover 35mm. A standard by which other prime lenses were measured between the 1930’s and 1950’s, the Cooke Speed Panchros were estimated by George Eastman to have captured approximately 90% of 16mm films shot during that time in America. After an intensive design and development process, the TLS team developed and refined a brand new housing that adds modern functionality to an archaic form without losing the “Cooke Look”. With imperceptible backlash in the focus movement, zero image shift and smooth transition of the optical unit within the lens housing, the TLS re-housing has become the standard measure of which professionals have become to expect from this process. Positive stops on the focus ring are designed to withstand the rigours of modern day drive systems that can often overrun the frail end stops from some earlier designed re-housings. The iris ring is also governed and designed to stop cleanly at either end of the scale. Internally adjustable stops on the iris aperture ring mean that the lens can be set to overrun the end markings, if required, but this will not necessarily mean that the lens will open or close any more than the original specified settings. The shimmable stainless steel PL retains the iris datum ring using eight cap head screws. Using a similar setup up to the Cooke S4, the iris ring is freely rotatable on the main body of the lens and set on a pair of split bearing rings that keep the two components apart. The variable pitch cam that guides the optical unit gives the focus puller an even spread of the focus scale around the circumference, which is particularly useful towards infinity. The cam groove inside the focus barrel has been calculated and cut to give a constant acceleration of the optical unit along the barrel during its rotation. Machining the two part, sprung loaded cam follower that runs along the cam is an intricate operation which is critical to gain the correct ‘feel’ of the finished lens movement. The same can be said for the machining of the cam groove with surface finish, produced to give a smooth movement of the optical unit within the housing. The entire focus movement is designed to give reliable, repeatable, progressive and constant performance throughout its working operation. The internally adjustable focus stop gives a clean, solid halt to the travel at either end of the scale. Once set, it must hold its position as it is matched to the cam groove and focus scale on the outside. Spring-loaded support bearings on the internal carrier help give the optical unit a smooth and cushioned ride along the inside the lens barrel. The focus barrel is held on a specially designed bearing that eliminates shake and free play from the focus movement in the focus barrel. This is a key component to the whole re-housing. Externally, the focus and iris drive rings both have 0.8 MOD drive gears that will be the same size and in the same position throughout the whole range of Speed Panchro re-housings. The dual focus scales can be requested in feet or metres with a standard amount of markings. Additional intermediate markings would be possible upon special request. The front diameter is 110mm and can accept standard matte box clamp rings and doughnut adaptors, without affecting the focus movement. The front diameter of the lens has been set at this dimension to ensure that no vignetting takes place in the corners of the Academy format, which the original Speed Panchros were designed to cover. The front internal filter thread is M105 x 0.75 pitch to accept standard filter of that diameter. Deep internal reicing on the inside of the front carrier helps reduce internal reflections in difficult lighting situations. Made from stainless steel, brass and aircraft grade aluminium, the whole lens is now brought up to modern day specification. You can now capture that “Cooke Look”, and be confident that their modern housing allows them to stand up to the rigours of modern day production. Given the reliability and solid construction of the Cooke Speed Panchro conversions, TLS has now moved on to re-housing other classic, vintage lenses from both Kowa and Bausch and Lomb. Future developments include the conversion of the Canon K35 series, alongside other suitable manufacturers’ lenses, which are constantly being appraised for conversion suitability.